One of the most frequent questions I hear from tummy tuck patients at my Austin plastic surgery center relates to scarring. Many people are worried that their scar will be visible when their midriff shows, which can be concerning when one of the reasons to undergo surgery is to feel confident about your body. However, if you choose a highly skilled, board-certified surgeon with years of experience performing tummy tucks, and you carefully follow post-op care instructions, there is a great chance that your scar will heal beautifully. 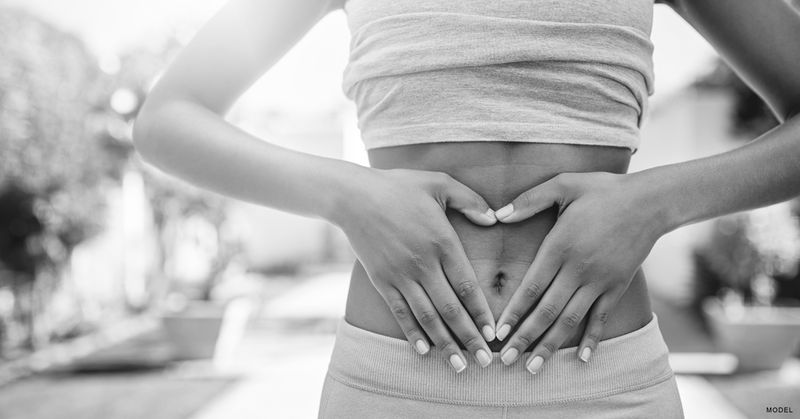 It’s first important to understand that the surgical incision used in a tummy tuck is truly necessary to accomplish all of the outcomes of this transformative procedure: repairing muscle separation, reshaping the belly button, and removing excess skin and stretch marks. First, I plan the location of the incision and place it as low as possible. Typically, patients want it low enough so that it can be covered by bikini bottoms or low-rise jeans. In the 1980s, it was fashionable to wear high-cut swimsuits, and many surgeons still place the incisions higher up. Unfortunately, those scars are visible with modern fashion. When I close the incision, I use several techniques to ensure that it heals as a pencil-thin scar. A combination of progressive tension and an interlocking suture material called STRATAFIX™ allows me to remove tension from the skin edge, a technique that provides the infrastructure of a beautifully concealed scar. About 4 weeks after the procedure, I start my patients on TNS Recovery Complex®, which stimulates the skin’s natural healing process and enhances production of new, high-quality collagen. This topical treatment is applied directly to the scar. I also prescribe a medication that we have formulated to keep your scar flat and prevent thick or keloid scar formation. To aid with this part of the process, we apply external pressure to the scar with paper or silicone tape. I encourage all of my patients to carefully protect their scars from the sun or any UV-light exposure and if in the sun, to always protect with a sunscreen with at least 7% zinc. Sunburns develop much faster on scar tissue, and this will worsen the appearance of the scar. At this point, the scar may look red or thick due to increased vascularity surrounding the scar. This is normal during the early phase of the healing process, which usually lasts from 6 weeks to 18 months. At 3 months, you move into the maturation phase, at which point the scar typically looks flat and is pinkish in color. The most important scar care at this time is to continue avoiding sun exposure. This will be necessary for about 18 months. Some patients want to expedite the final healing process, so I also offer intense pulsed light treatment, which targets a range of skin conditions, including scarring. IPL uses specific wavelengths to penetrate the skin and treat the damaged area. I take great care to make sure I expertly perform Step 1: Meticulous Surgical Technique. And my team and I invest in you with detailed education to make sure you can carry out Step 2 and Step 3, which makes complying with our guidelines very important. Despite this, sometimes the scar does not heal as planned. This is usually due to an underlying genetic component with your skin that we cannot control. In this case, we offer scar revision treatment that can still provide an exceptional outcome. Visit our photo gallery to get a better idea of your potential with tummy tuck surgery. If you want to learn more about tummy tuck scarring or want to discuss your body contouring options, request a consultation online or give us a call at (512) 551-1067.